The classroom community Maria Montessori described above sets the foundation for the future world of peace and acceptance she described as only being possible through education, not through politics. As students get older, they increasingly interact with the community at large, and hopefully they will contribute to the same sort of vibrant and cooperative society outside the classroom. After you have read about the Troost Avenue Festival, perhaps you might wonder what other kinds of festivals communities host. You may be surprised at the wide variety of events communities have designed. Search these sites by date, region and type. Award-Winning Literature Resources, 20% Off! Many of us, young and old, enjoy the opportunities for free and unhurried reading that summer provides. Some of you may already be feeling that the start of school is fast approaching; but even for those with the earliest back-to-school dates, there is still plenty of time for summer reading adventures. Literatureplace.com uses internet technology to offer varied reading and language arts resources for parents and teachers. Some of you may be familiar with their Bookfolio products and curriculum collections. You may also have read about their newest line, Start With the Winners!, which helps you find the most-awarded titles for children and young adults. Right now, Literatureplace.com is offering “Super Summer Reads,” smaller collections of some of the most noteworthy books for each age group, specially chosen for your students’ reading pleasure. For a limited time, these lists are being offered at a 20% discount as part of their July Special. If you buy now, you will also be added to the website’s customer list and notified of other upcoming monthly promotions. Find out more about both Literatureplace.com and this special sale by visiting https://www.literatureplace.com/Start_with_the_Winners/ Click on the age group(s) in which you are interested. Then click on “July Special” at the top of the each list to find out more about options and prices. If you haven’t had an opportunity to read the article in the Montessori Community Service Projects reblog below, please do so now. You can easily adapt the Valentine project for a meaningful summer camp group activity, as well as solitary summer homescooling project. The green bag pictured below was purchased from Joann.com Fabrics. See http://www.joann.com/busy-kids-kids-camp-value-pack-drawstring-bags-set-of-5/zprd_11308525a/ If this item is not sale priced when you view it, try purchasing something comparable at the Dollar Tree, Michaels, etc. 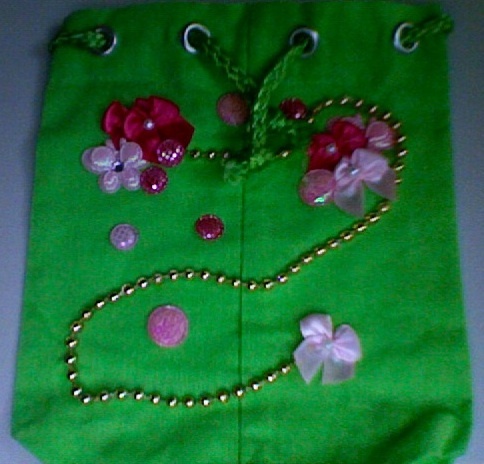 Appliques and beads were added to give a festive look! Trial sized perfumes, hand lotions, and other useful gift items can easily be tucked inside each bag designed. For a special finishing touch, wrap your small gift items in coordinating colorful tissue paper purchased at the dollar store. The language arts provide the foundation of a student’s ability to express themselves effectively, both through speech and in writing. As parents and teachers, we are wise to continually look for new and engaging ways to help keep the children in our lives sharp in language-related abilities.